A letter of rejection can be like a dagger through the heart. You work so hard and put so much of what you are into your performance that to have it rejected for whatever reason, it's like having your best friend ditch you at a social outing because she/he doesn't think you're "cool" enough anymore. Or something like that. Rejection, no matter the form it comes in is not a happy place to be in. It can tear a person down and make them depressed and troubled but on the other hand, it can be fuel to work harder and try to achieve new heights and make the rejector feel shame and loss at what they've done to you. As a musician, I have had to deal with rejection a lot. The first music camp I ever auditioned at, I was rejected. The following year, I got accepted into not one, but two programs. I took my chances and picked another, harder to get into program, and was once again met with rejection. That rejection letter, that most recent one from last year really tore at me somehow. My teachers, friends and family thought I would all be accepted, although my friends and family always think I should get accepted, that's what friends and family are for, but even my teachers were encouraging that I would get in, no problem. I gave myself room to hope a little, unlike with the first rejection letter I had years prior when I hadn't allowed myself to hope or dream that it might actually happen, this time, I gave in and I hoped that my intense want to attend would be enough to get me into the impossible. Hope. Encouragement. I didn't get in. I was met with rejection. Again. I went into my room calmly to be alone, I dealt with it in my own way and the fight began to prove my worthiness. There was always that twang of doubt in the back of my mind though that I couldn't do it, that I needed to give up and make way for the younger, better players out there and get a real life for myself. I persevered. University auditions have by far been one of the most emotionally trying things I've ever done when it comes to my music career so far. I knew over a year ago when I started thinking about where to apply that it was going to be a challenge but I had no idea. That roller coaster you can be on through a good stretch of practicing and performances that sometimes suddenly and unexpectedly drops has not only the drops but cork-screws, and loops and all of them leave you clinging to the handle bars for help and the hope that you'll make it through the ride alive. If I had to describe my university prep year this past 8 months, roller coaster, a big one with all the terrifying fixings, would be the best example I could describe. I had my highs and I had my lows and they, like a roller coaster, would sometimes change in an instant. I'd be thrown a curve ball and not have the experience or tools capable of being able to negotiate it and hit the home run. Up until last September I would go through one, maybe two major burn out periods a year. They might last a week or two at the most and were usually the result of a combination of school, work, performance, practice and lack of sleep and ability to keep up with it all. Starting in September, I was feeling good. I was energized, back to work with a flourishing studio of students that would prove to only grow and provide me with a great deal of satisfaction and enjoyment and challenge! I was taking only two courses at school for first semester to upgrade so I'd have more things on my transcript when I applied (I ended up dropping one of those because my teacher was very unreasonable) and all in all, I felt great. October rolled around, I was still feeling pretty good, but the pressure was starting to settle in a little more heavily as I realized I'd be having a very limited amount of private instruction to prepare for these auditions and I had hopes of auditioning for the Banff Centre over the Christmas holiday. I eventually decided in November after some major burn out (I felt really gross about practicing and the whole bit for over 3 weeks) that I would not audition for Banff and focus on the more important things. My mom consented and I managed to get a lesson a few days before Christmas which boost my energy and enthusiasm through the Christmas break. January rolled around and I was still feeling pretty good although I usually had about 2 days a week where I felt frustrated with my ability to advance in my playing. By February I was agonizing over the auditions and all I wanted was to be done or give up. It was incredibly hard to stay focused. I was getting sick of the repertoire, I felt I had reached a more or less stand still point in my audition repertoire. It was a gruelling month to get through and my mind was on overdrive constantly. I wasn't sleeping properly at all and mood wise I was in a perpetual state of PMS throughout. Finally March 1st rolled around and I was starting to see the home stretch. I had a lesson a few days before my first audition that gave me the boost I needed to stay focused. The day before my first audition (as most of you already know) I managed to injure my hand pretty badly. Despite the pain which I can honestly say is the most pain I've ever experienced, I played that first audition and wrote the theory and English entrance exams. I put myself into that amazing performance element and managed to block out the pain through much of my performance though I sure felt it towards the end. I made it through though. With very little physical practicing for my next audition I managed to memorise the third piece which I had stuck out of my mind while I worked on the repertoire for my first audition. I got through that audition, then came my final audition. With next to no practicing for weeks on end, my endurance levels were not what I would have wanted and with little sleep the night before I walked in and played. I didn't get nervous at first though I was severely over-tired and stressed hoping my coffee would keep me awake and focused for what I needed to do. The nerves hit when my pianist started the introduction. I felt like that roller coaster of up and down with my level of burn out to my level of enthusiasm was realising itself in my playing - starting out badly, getting better, worse, better again, worse etc. But I survived! Rejection is what I expected. Rejection is what I had prepared for. The postal system lost one of my audition packages, it arrived late. Papers that weren't my responsibility from my school and elsewhere didn't arrive when needed. Rejection it seemed was written across my forehead (unless you asked my friends and family - that in itself put stress on these auditions to succeed). Nothing was going right. More stress. Less sleep. Harder to maintain my focus. That burn out thing was really taking over this time around. To my surprise, but apparently not to anyone elses, I received my first letter of acceptance. I was thrilled! Last week, early in the week, a second letter of acceptance. 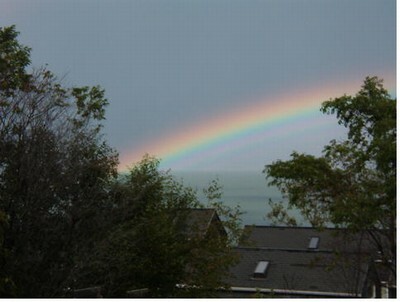 I was feeling completely on cloud 9 and was so sure that I had my studies figured out. Surely I wouldn't get into 3 out of 3 institutions. Especially considering the competitiveness of the 3rd place. To my complete shock and surprise I got in! So I was left with the decision of three places. I was left feeling like, why couldn't just one place reject me and make my decision easier! But no. Life has a funny way of surprising us and this has been a huge surprise and incredibly overwhelming but also incredibly thrilling.And now the decision has been made. It was a hard choice but I've researched, sought advice from someone I respect a great deal in the music field and have come to a conclusion. I will be staying here on the west coast this year and be one of their new violin performance majors at the University of British Columbia. I'm so excited and I can't wait to get started. Thank you all for your wonderful comments and thoughts and congrats! I've made my decision but am notifying the necessary people before announcing anything officially. :) Hopefully by tonight I will be able to write a blog about my decision. OH MY WORD. I've been accepted at all three institutions - Dalhousie, Memorial and UBC. I have 48 hours before the first deadline and I will greatly appreciate any words of wisdom and thoughts and prayers as I try and figure things out! It's another case of, "I wasn't going to update until" but I feel like writing, so here I am. The past couple of weeks have been pretty crazy! First with my UBC audition which was my third and final audition for university. Parts of it went really well, parts of it went really bad. I was completely out of it for most of the day that day. I hadn't slept hardly at all the night before and then my pianist was around 40 minutes late, leaving 20 minutes before my audition began due to traffic problems, so not only was I tired and out of it, I was stressed! But moving on...since those 12 hours in the car to and from Vancouver for the audition I have spent a total of 26 more hours in the car to go to Edmonton and back. I got to see my brother graduate with a diploma in music composition and what did he do to be "original" at the diploma presentation, walk across the floor? He pretended he was in the olympics, ran out and jumped into a somersault! I was expecting him to be "unique" but not that unique. I did get to see the famed West Edmonton Mall which was big but not as big as I somehow thought it would be. However, I came home with a couple of cd's and badly needed purse with workin zippers and latches!!! I also have begun physio therapy for my hand to try and help the healing process since it seems to have come to a stand still. And finally, in closing, I also was accepted into Dalhousie University!! Just waiting on UBC now which I will know in the next 24 hours!!!!!!! 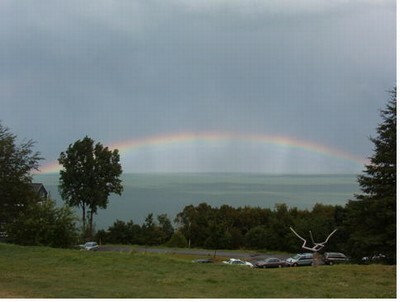 Here are the pictures of the rainbows that I captured at Domaine Forget back in summer 2005. I'm done auditions! I had a long day at UBC yesterday (almost 5 hours) by time you including time to warm up for the audition, the audition, the theory exam and then the aural exam. It's good to be done and no longer have that stress to be practicing and prepared. My hand will finally get a chance to heal! The drive home yesterday evening (all 6 hours or so of it) were interesting! I drove on the highway through Manning Park. It poured rain, it was sunny, it was snowing.....quite the weather but I managed to snap the below picture just north of Chilliwack (not while driving). I was lying in bed last night, trying to go to sleep and for whatever reason a brilliant title for this entry popped into my mind. Do you think I could remember it now, 8 hours later however? Nope. Maybe it will come back to me before I'm done typing. Tomorrow I leave for Vancouver to do my final audition for university at UBC. I'm excited and a bit anxious. I'm really happy that my collaborator (pianist) is a good friend of mine and roommate from a program I studied at last summer in Vancouver (YAE) and it will be good to see my sister again. I'm also anxious to have this audition be over with so that I can give my hand the break it's been begging for since 5, almost 6 weeks ago when I injured it. I can't wait for it to get better and being able to get back to practicing again. I'll be in Edmonton for awhile, well ok, mostly on the road to and from Edmonton for several days shortly after arriving back from my audition so I won't have to worry about sitting around not being able to do anything and having my violin staring at me, tempting me to play when I know I shouldn't. Though, I could do some composing if I were home! Hmm... long road trip vs. composing... well I guess I don't really have an option, I've already committed to the road trip, so that is what I'll be doing. Yesterday was a very much "scratch my head" day as far as teaching goes. I teach two Suzuki group classes on Wednesday's and yesterday, the "group" part of "group classes" wasn't happening, unless you include me, the kid who showed up and the parent of the kid who showed up as a group. I'm not sure the one student was too impressed because she has a private lesson with me right before group begins and so she got a 1 hour long private lesson. You could tell her concentration and enthusiasm was beginning to fade at a rather quick rate by the end of it all. Ok, not much else is exciting right now and I still can't remember my brilliant title so this entry will have to suffer because of it. Happy day everyone! I have started going through my room with the knowledge in mind that I'm most definitely moving out in a few short months. I know the time is going to fly so I'm going to try and devote a half hour or so to going through my things every other day. It's funny, some of the old "treasures" you can find going through things you haven't looked at in years. I found this hilarious article in a newspaper clipping in regards to a performance I did some time ago. "A very professional performance by Kelsey Zachary was the final gust artist and he played his violin in fine style." I had to laugh at the grammar and the apparent ignorance of my gender. I didn't think guys wore dangly, sparkly earrings, or black embroidered blouses or little fake flower hair ornaments. I also thought my voice wasn't particularly low pitched (I'm considered a soprano) and anatomically, I look quite different and (no offense guys) smell better than most guys. My only recollection of that whole event and what might have brought on the male connotation of my being is that there was a fair bit of alcohol being consumed. I also found old school stuff from when I "tried" math 10 and English 10. I figured that since I passed math 12 and English AP 12 and English Lit 12 in the past year that I could recycle those old books of assignments that were left unwritten in beyond my name on the first page. Apparently the 40 page introductions must have disillusioned me. Or that's my excuse. Old pictures are also popping up, clothes I'd forgotten I had and wished I didn't remember that I had. When were those overall shorts/skorts thing the "in" thing anyways? Maybe this will be a character building experience, digging through my closet, a journey of self-discovery, discovering my past, my childhood, coughing in the dust. Sneezing. Does anyone have an old miners hat with a working light I could borrow for the next 3 months? I have a dilemma. A good dilemma, but a dilemma. I've been accepted into Memorial University for their music program (yay!!!) with the recommendation of a very substantial scholarship. Now for the dilemma. I have to give my response by April 13th. I won't have even done my last audition at that point and I won't know the results of my second audition until the following week. I'm ecstatic and a little confused about my next step. I wasn't going to update this until I had something more exciting to write about but I'm not really interested in surfing the net right now or doing the other usual things and I'm still not supposed to play my precious violin which is sitting in its case weeping because of the lack of love it's recieved in recents weeks. So yes, still two auditions done and one more to go and still no results from the first two places as of yet. Maybe there will be a letter in the mail when I pick it up on the way home! Maybe there won't be. Hmm. There! I've managed to waste 5 minutes of my life!!! !